What would make you blind-buy an anime series? Anime is probably the most expensive home entertainment form, demanding prices that would make most non-fans blanch. We’re reaching levels of around £50 for a 13 episode series again, prices not seen since the days of the single volume release, when 4-episode discs would retail for around £20 apiece. Admittedly, before the advent of Blu-ray, anime on DVD was beginning to be devalued, complete series collections debuting around the £25-£30 mark, and I guess in terms of inflation, we’re around where we need to be for anime distributors to not go out of business, but that’s still a lot of money to drop on something you know little to nothing about, if you haven’t streamed a show. But there are events like Madman Entertainment’s end of year clearance sales, where series can be had for as little as AU$10. When you’re dropping not much more than £5 on a series, it’s a lot easier to take a chance on something you haven’t even heard of. Which is why I’m now watching a show called Code:Breaker. Sakura Sakurakoji is the popular girl in school, polite, principled, hard-working and honourable, and her life is heading in the right direction. That’s until the night she witnesses a slaughter, a group of men incinerated in a blue fire, and at the heart of the conflagration, the figure of a young man, apparently responsible. By the time she contacts the authorities and returns to the scene, there’s no evidence except for some scorch marks on the ground. 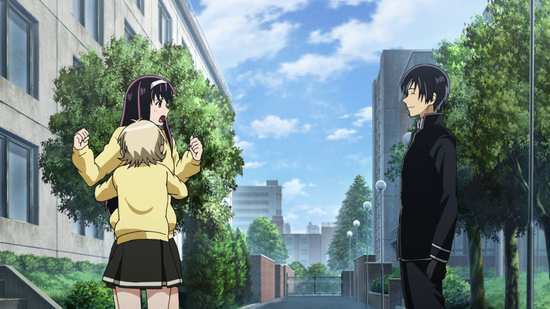 The next day, a new boy transfers into her class, Rei Ogami, the boy responsible for those deaths. Sakura’s life has got a whole lot more complicated, as she resolves to stop him from killing again, despite the fact that her life is now in danger for more than one reason. 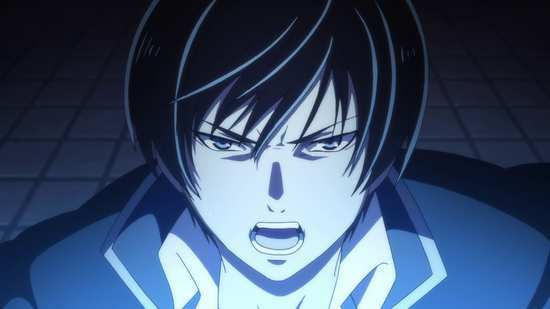 For Rei Ogami is a Code:Breaker. A boy with special powers, he’s been put to use by the government to pass judgment on criminals who operate outside the law. 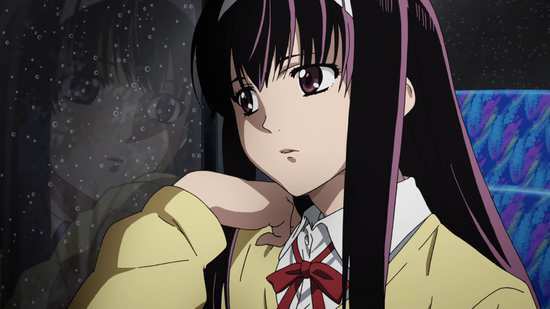 13 episodes are presented across 2 Blu-rays from Madman Entertainment. 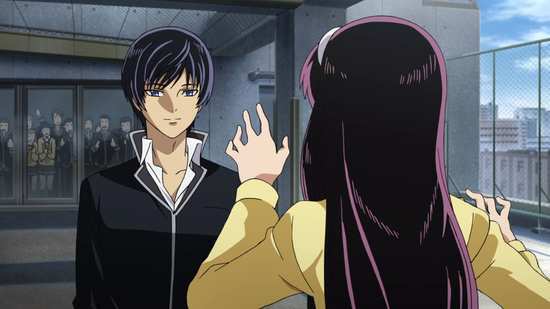 Code:Breaker gets a 1.78:1 widescreen 1080p transfer on these discs, and it’s a fine presentation, clear and sharp, well detailed and with strong consistent colours. Much of that is down to the look of the show, deliberately retro in terms of character and world design, looking more like a show from the eighties, and that simplicity of aesthetic means that there is little if anything in the way of compression, aliasing or even digital banding. This is a crisp, clean transfer that presents the animation to excellent effect. You have the choice between Dolby TrueHD 5.1 Surround English and 2.0 Stereo Japanese with subtitles and signs locked to the appropriate track. I didn’t bother with the English track at all this time, so I can’t comment on how well it works, and instead I stuck with my usual preference of Japanese with subtitles. 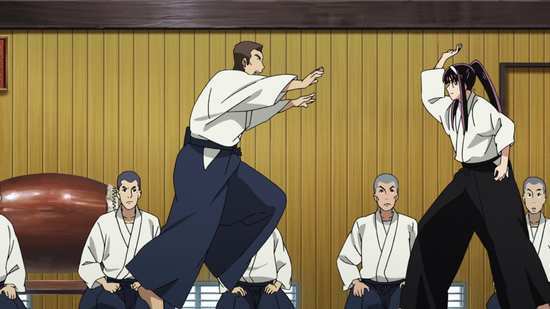 The actors are cast well for their roles, and the performances exceed what you might expect from the animation style. The action comes across well, even with the basic stereo track, and the show gets an orchestral score that verges on the theatrical at times. This is a TV anime that thinks it’s a feature film. You get 2 discs in a BD Amaray, one on a central hinged panel. The discs boot to animated menus. Disc 1 autoplays with a trailer for Attack on Titan. There is an audio commentary on episode 7, featuring Micah Solusod (Ogami), Todd Haberkorn (Toki), and Jerry Jewell (Yuki). Disc 2 autoplays with a trailer for Deadman Wonderland. There is an audio commentary on episode 12 from ADR Director Colleen Clinkenbeard, and Jessica Cavanagh (Hachioji), and Ben Phillips (Fujiwara). You get 1:35 of Japanese Commercials, 11:13 of Promo Videos, 1:12 of TV Spots, and the US Trailer for the show. The Textless Credits with locked subtitles are there, and Funimation trailers for Psycho Pass, Jormungand, Shiki, Serial Experiments Lain, Dragon Ball Z, Aquarion Evol, and The Devil is a Part-Timer. 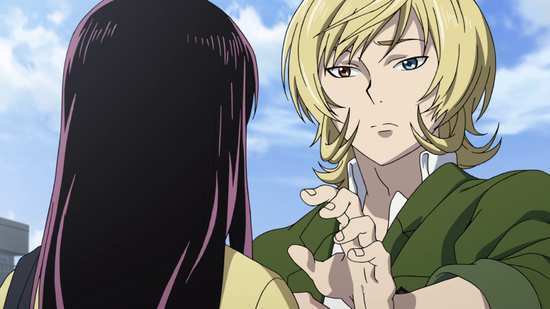 Code:Breaker is a confusing one. I wound up enjoying it in the end, but I had to work at it. The thing about this show is that while it is a recent one, and the manga too is barely ten years old, in terms of visual aesthetic, and in terms of storytelling style, this feels like a much older show by at least a couple of decades. Certainly it’s refreshing to step away from the current fashion in character tropes, and shows like Ushio and Tora have shown that there is an appetite for modern takes on retro anime. But Code:Breaker doesn’t have the cachet of something like Sailor Moon, Dragon Ball Z, or The Guyver to warrant a modern day remake. This is a ‘new’ show made in a vintage style, and it stands out for mostly the wrong reasons, at least at first. 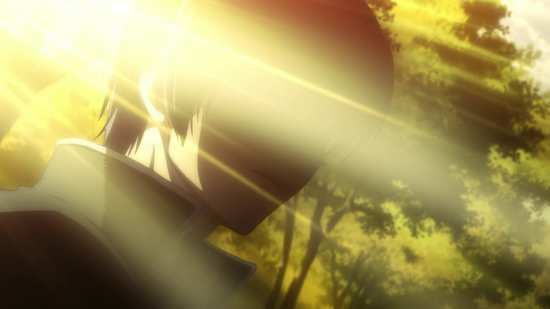 It’s in the simplicity of characterisation and the character writing that Code:Breaker is weakest, with Sakura Sakurakoji written as a ‘perfect’ girl, strong and forthright, and when she witnesses one of the Code:Breakers at work; Rei Ogami incinerating a gang of thugs, she just has to get involved, especially when he transfers into her class at school. The Code:Breakers are a government run group of super-powered teens who deal justice to those who stand outside the law, only their idea of justice is terminal. 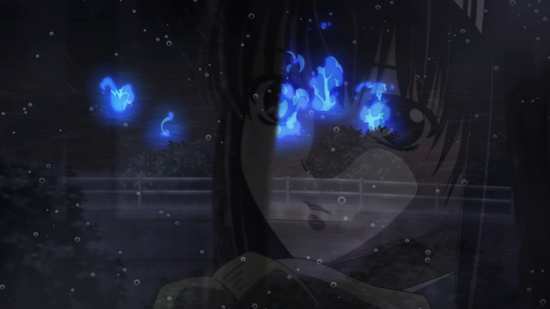 Rei Ogami has fire powers, we later meet a boy named Toki who can control magnetism, Heike who can control light, Yuki who has sound powers, and a girl named Hachioji who can control shadow. Sakura decides that no high school boy should have the power of life and death, and seeing intrinsic goodness in Rei, she determines that she will stop him from killing again. That sort of cramps Rei’s style, who has set himself up as the evil that destroys evil, and who doesn’t need this girl constantly reminding him that he is still human. 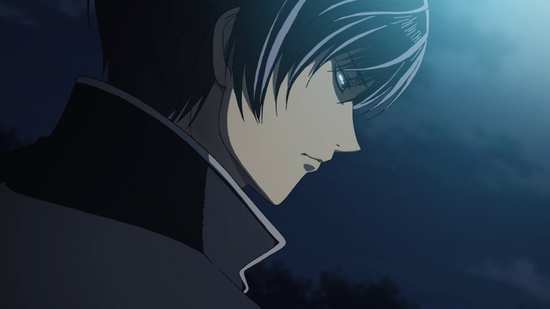 It also makes his search for vengeance a little harder, as it’s quickly revealed that he has a grudge against someone called Hitomi. Still Sakura inserts herself into this secret world of Code:Breakers, and the foes they face, often with super-powers themselves, and she becomes the centre around which this group of initially, mutually antagonistic special agents coalesce. It’s all so twee and old fashioned, it very much feels like an anime from the nineteen eighties, albeit with 21st Century production values. It’s not until we learn more about Hitomi, Rei’s personal bugbear that the show begins to develop in an interesting direction. Unfortunately, it’s a highly derivative, and unoriginal direction, but it at least has more intellectual weight and emotional depth than say the first half of the series. 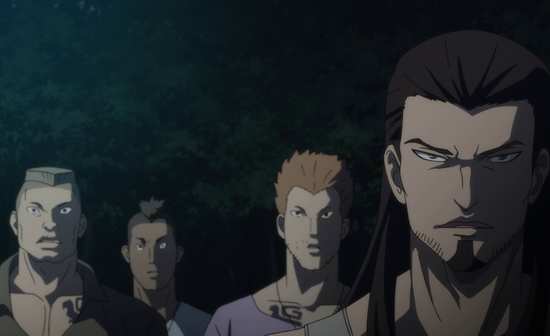 It’s when we learn that Hitomi is the villain of the piece, that he used to be an idealistic and heroic Code:Breaker himself, but now that he has betrayed the group, he’s become the exact opposite, a heartless terrorist. When the motivation behind his actions is revealed, the inspiration for this show becomes clear too. The super-powered Code:Breakers and the other powered characters are mutants, and Hitomi is Magneto, fighting for mutant rights the only way left open to him. So it’s not the most original of stories, but the show certainly gives it some welly, amping up the histrionics and melodrama as far as it goes, and then a little more. When it gets to the finale, we’re in serious cheese territory, but given the show’s visual aesthetic and writing style, that actually feels appropriate rather than out of place. The downside of the conclusion is one that is far too common. 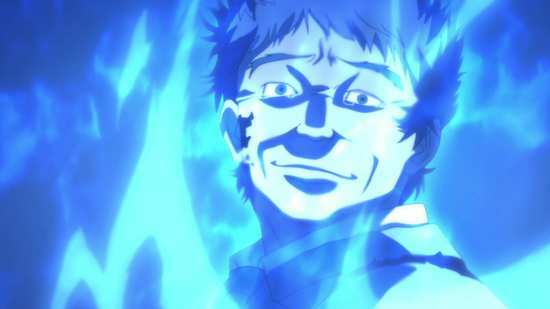 It’s an open-ended final episode that leaves you expecting more from Code:Breaker. 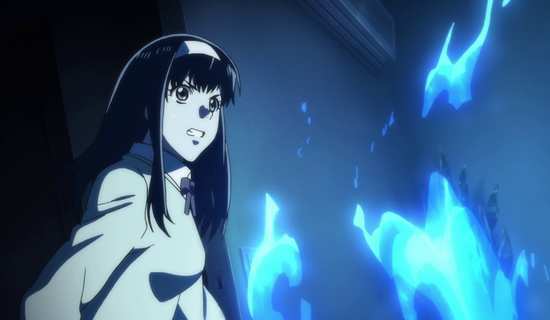 Actually, I think it really leaves the creators hoping for a second series more than the audience probably does, as while Code:Breaker entertains, it never rises above the average.